After a lifelong pursuit towards musical perfection, Stephen Robert Young on Dec. 21st, 2017, joined the heavenly choir. Coping with advanced cancer for the past three years Steve kept his music, sardonic humour and love of those around him going strong. Even as his health failed it was about the music and bringing on the higher power that only a good tune brings forth. 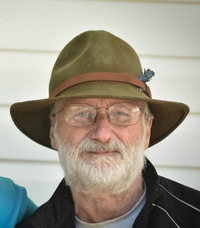 He passed peacefully in his sleep, at his Sauble home with family and friends nearby. Departed too soon, but lived a rich, full life of unionized industrial construction, home building and renovation. All types of outdoor appreciation and recreation, hiking and biking, trips to Florida, music festivals and above all jamming where ever he could. Survived by partner Julie Dwyer-Young, children Dan, Kate, Sarah-Jo, Alicea, Bernadette and Justine. Father-in-law to Dwayne Cook and Cory Aitken. Happy Grandpa to Hannah, Liam, Nikki and Robyn. Great Grandpa to Aubree and Alexis. Uncle to Charlie and Rachel, Dharma, William and Lauren, and Amanda. Predeceased by father Carl. Survived by mother Eileen, brothers Nick and Andrew and sister-in-law Jackie and sister Carol (Down) and brother-in-law Frank. Sat. Dec. 23rd there is a private in home prayer service, followed by cremation, with a Celebration of Life to happen soon. He, and all his family, deeply appreciated the support, concern and love given by friends. Heartfelt gratitude to the cancer treatment team at London's Victoria Hospital, Dr. Huff and the Owen Sound Palliative Care Team, Whitcroft Funeral Sauble Beach and devoted caregiver Molly McGuire. Donations to The Great Trail or Ignatius Jesuits of Guelph Old Forest Growth Project appreciated and can be made through the Thomas C. Whitcroft Funeral Home & Chapel (519) 422-0041. Condolences may be expressed online at www.whitcroftfuneralhome.com Our sorrow is deep, but consolation is found through Steve's memorable harp tunes which will live on with us all and maybe we'll catch a rift or two coming through on a celestial wave length. Play on Steve - till we meet again.